Shwish, shwash, swhush: I am flying onto the stadium, my black cape flickering behind me, my drum-sticks swishing through the air like ninja swords. The National Championships 2013 has started. The Bass drums are thundering and suddenly the entire battle field is filled with music-playing samurais. The crowd is cheering and whistling, some are quiet, did they like it? Will the judges like it? 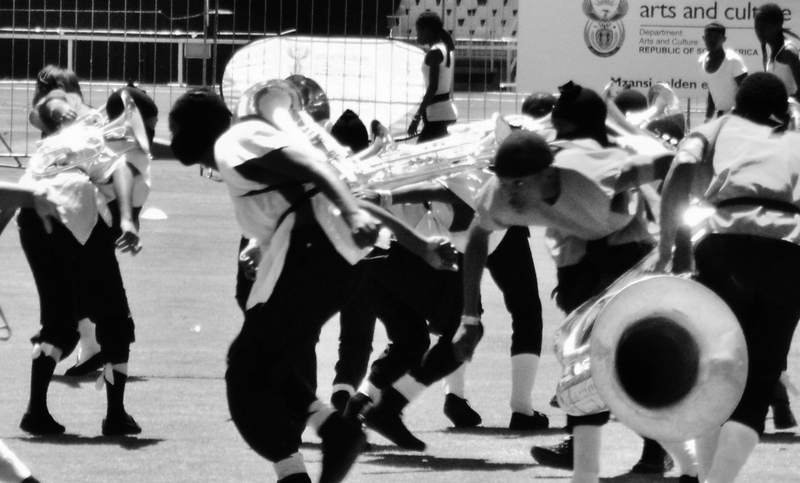 Music and dance was filling Wanderers stadium in Johannesburg this weekend when around 1700 kids were performing and competing for the title of being South Africa’s best Field Band 2013. We, in the Pulse project, were lucky to be witness to it all. An amazing energy and drive from the kids and tutors made it an unforgettable experience. After months of practising, the bands were finally meeting to share musical experiences and show off their talent and hard work to each other. Creative choreography, difficult musical passages, tricky transitions and challenging dance-moves were all mixed together into compositions and spectacles that to us seemed impossible. Trumpet-players were playing crazy loud and powerful while walking backwards. Dancers were doing flips while crossing in between the drummers that were playing on each other’s drums while throwing the sticks in the air. What’s worse they make it look easy; how is that possible? We figured that it has to be a result of an amazing ability to work together as a team combined with an enormous passion for music and dance. Through our observations, it seems like both members and tutors have a great pride in their bands and love to be a part of the team, a part of the show and a part of the competition. Music and dance also seems to be a perfect medium for making the members enjoy all the hard work prior to the competition. While they are rehearsing they are also continuously performing, expressing emotions, mastering instruments and difficult moves, enjoying the music and it seems, feeling this sense of belonging, being a part of a team that is working towards a common goal together. These observations have brought us back to some of the considerations the south participants had on Music, Health and Life in the previous post. Most of the words they use to describe health points to health as something more than merely absence of disease. Health also concerns our psychological state and feeling of well-being. Happiness, a sense of mastering, self-esteem, energy and social health are all words the south participants used that seemed to be very present among the field band members during this weekend. Further when describing music, the south participants were not merely talking about rhythm, melody and harmony but also about states of wellbeing; communication, emotions, joy and passion were words they used. In a very inspiring way they also used the word life. Seeing the passion that the field band members put into their performances this weekend, we can really stand behind the Field Band Foundations slogan: Music for life !